Jesus allowed me to be saved from my battlefield wounds—alive only by the grace of God—and return to live my life again. I now know He was always there, remaining with me through all my recovery and rehabilitation that continues even today. Twenty-two years of active duty military or service to veterans in the Department of Veterans Affairs are a part of my life. I imagine I have heard the width and breadth of the military experience: sheer terror when under fire, sadness for those killed beside us, or regrets of the medics because not all were saved. We recall agonizing battlefield memories, sleepless years, triggers of war, and spouses talking about explosive tempers and weapons close at hand. Despite counseling, psychotherapy, group sessions and years of pills, there never seems to be any real lasting relief, with many suffering until death. We each have our own demons. 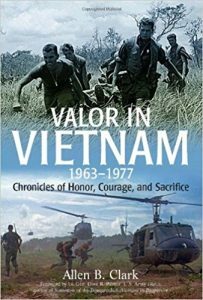 I had my own personal brush with Post Traumatic Stress Disorder after losing both legs below the knees in a mortar attack during the Vietnam War. Harboring anger and sadness, I was stressed out from fears of ever walking with artificial legs, the ability to have and raise children, and obtaining gainful employment upon my release from the amputee ward at Fort Sam Houston, Texas. During my medical center rehab I had to be admitted to a closed psychiatric ward and required individual psychotherapy for five years afterwards. But by the grace, love and healing power of Jesus, I have needed neither anti-depressants nor a psychiatrist since the mid-1970s. 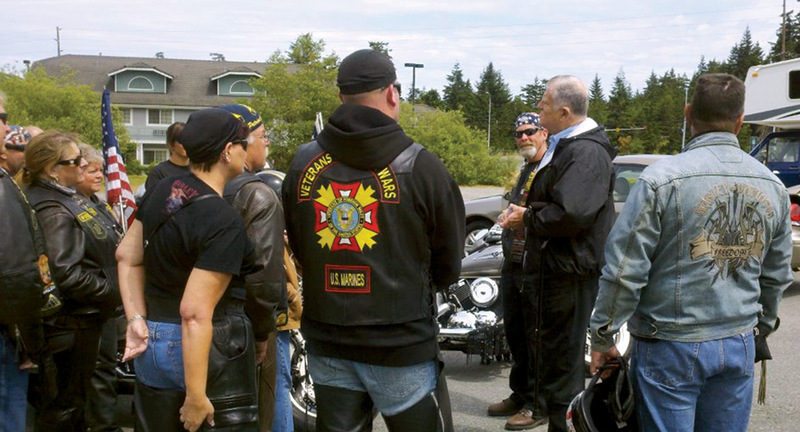 Captain Allen Clark (second from right) talks with some of the Patriot Guard Riders, a national motorcycle group comprised of veterans and civilians who honor fallen military heroes and their families at funerals. There are two elements critical to our healing: resiliency and identity. Resiliency is the ability to bounce back and recover from setbacks. One identity is a patriotic, loyal, and courageous warrior. A more important identity, however, is as a person of faith—and mine is as a committed, faithful Christian. True Christian identity is reflected in these truths: we are all guilty sinners, deserving of punishment for those sins; Jesus Christ died for us, paying our sin debt; and He offers us the gift of salvation only received through personally accepting Him as Savior. A method I use for the healing process is to audit three arenas of my life: unhealed hurts, unmet needs, unresolved issues—evident in all lives, but especially to those of us who have been to war. Once listed, in another column I list what it would take to heal the hurts, meet the needs and resolve the issues. Column three is simply praying that column two is satisfied. Jesus allowed me to be saved from my battlefield wounds—alive only by the grace of God—and return to live my life again. I now know He was always there, remaining with me through all my recovery and rehabilitation that continues even today. I seek to follow Him in all ways and over the years have grown in my faith, and also in height—5’8” to 6’2”—with new artificial legs! My peace and hope is found in Jesus Christ, whose offer of forgiveness from sin and the gift of eternal life is for anyone who will trust in Him: “For God so loved the world that he gave his one and only Son, that whoever believes in him shall not perish but have eternal life” (John 3:16). Dear Jesus, I know that I am a sinner and need Your forgiveness. I believe that You died on the cross to pay the penalty for my sin, and that You rose from the dead to give me the gift of eternal life. I now trust in You as my Savior. Allen is a West Point graduate who earned the Silver Star, Purple Heart, and Combat Infantryman’s Badge for his Army Special Forces service in Vietnam that cost him both legs below the knees. He is now involved in lay ministry, speaking to active duty, veterans and other groups about his own soulful battle with PTSD and the restoration coming only from Jesus Christ. 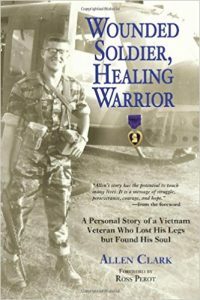 His book “Wounded Soldier, Healing Warrior” chronicles his spiritual renewal journey.